Start with what you have at home. Go through your closets and clean out old books that belonged to your children. Ask your family to do the same. Remember you will have a variety of readers in your classroom, so a variety of different levels is best! Collect used books from students. Your parents will be a great resource for free donations. If you set up a book drive, you will be surprised at the number of books you acquire. Ask a community business with lots of employees to do a book drive of their own. Also do not be afraid to ask them for a monetary donation. Your school library as well as your public library may be discarding old books. Check with them to see if they will help you out. Thrift stores and garage sales are another good way to find books. Though you will probably have to pay, it will be at a great reduction in costs. If you go to a yard sale towards the end, many people will let you take the books away for free! Scholastic as well as other publishers offer incentives for teachers who promote book buying through their catalogs and sites. This will earn you points for new books to add to your collection. Each year plan to spend a designated amount of money on books for your classroom. There are a variety of ways you can display books in your classroom. Trying to keep them in a particular order can be tough. 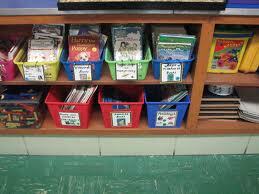 Using baskets or book bins with labels helps keep them sorted and neat on a shelf. It also places the front cover of the book facing the student which helps create interest. You can sort by genre, topic, author, “AR” (Accelerated Reader), levels, etc. With new evaluation standards be sure to include a basket labeled Cultural Awareness! Include books that share a diversity of cultures in this basket. Madame Libearian’s Guide to the Care and Handling of Books (it’s a large PDF file and takes awhile to download, but be patient because it’s worth it). You can also use this creative click-through online stories for kids on caring for books from Richmond Public Schools.